This vineyard is making some of the best wines on the North Fork. It is an added bonus that the owner, grower, and winemaker is a woman (hence one woman) and her name is Claudia Purita. Having grown up on her family's farm in Calabria, Italy she was exposed to the nuances of farming and exacting standards, which she has brought to her vineyard. Not only is the production limited, but the distribution is too, only selling her wines at the farm and TasteNY in Grand Central Station. The tasting room can only be described a quaint, as it is very small, but has a cozy (minute) deck overlooking the vineyards. 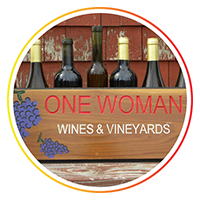 One Woman is not commercial or overrun, it's personal in every way and epitomizes North Fork charm.